Traffic mitigating solutions, the increasing demand for parking spaces, pedestrianization and the ease of walking around, and the constant need for nearby dining and retail establishments — these are some of the requirements of corporate employees today. 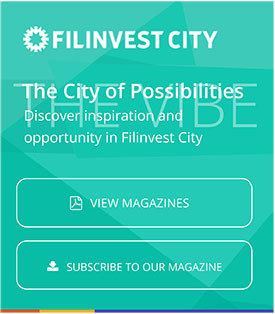 And thanks to the forward-looking vision of Filinvest City in Alabang, locators now have a self-contained, masterplanned central business district that progressively addresses these needs of city dwellers. Enjoy good music, art and a healthy dose of the outdoors when Filinvest City, the premier lifestyle destination in southern Metro Manila, plays host once again to the much-awaited “Wanderland Music and Arts Festival” on March 10 at its Open Grounds in Alabang, Muntinlupa. In Photo: After more than 20 years, Filinvest City remains bullish as ever. Excitement and anticipation build in Filinvest City, the premier lifestyle destination in Metro South, as it once again plays host to the 7-Eleven Run 2018 on Feb. 4. With its tree-canopied roads, verdant garden views, and fresh air, Filinvest City continues to provide participants a healthy dose of the outdoors. Filinvest City looks back to what was undoubtedly a memorable 2017, marked by numerous milestones and remarkable achievements that stand out in its more than twenty years of existence. Indeed, more than any other time in its history, 2017 was the year that has truly bolstered the position of Filinvest City as the premier garden central business district in the Metro South. Experience a unique Christmas sparkle that is bringing families and friends closer this holiday season. With the “Sparkle of Christmas at Filinvest City,” this masterplanned urban center and central business district in Alabang literally sparkles as its streets had been adorned with bright, festive lights—more so, as locators within Filinvest City are participating in the first building Christmas décor contest.